Listed below are free and paid-for books and ebooks, all unique to Understanding Cement. The faststart user-friendly insight into cement production, cement hydration and cement and concrete chemistry. Price: $65 US + $12 shipping worldwide. 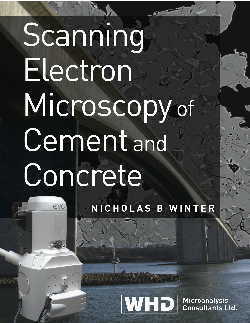 The essential book for anyone involved in SEM of cement and concrete. Price: $97 US + $10 shipping worldwide. Ebook describing some of the more common ways that factors relating to cement can cause low strength. PDF format. Price: free when you subscribe to "Cembytes", our newsletter. Click here or on the image to sign up for Cembytes. 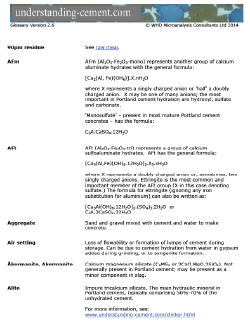 The Understanding Cement glossary contains over 100 definitions of words used in cement science. PDF format. A much-extended version of the free "10 Causes..." ebook, this Book/ebook describes many of the factors relating to cement that can cause low strength. Additionally, it suggests what analytical techniques might be used to identify them, where possible. Price: $47 US for ebook version, $67 US +shipping for printed version, for those who indicate their interest in advance. If you would like to be advised when this book/ebook is available (without commitment) click here. This book is a guide to analytical techniques used in cement and concrete examinations, intended for technical managers and others who commission investigations into cementitious materials. The book suggests what techniques may be used in particular circumstances, what the analyses may be expected to show, or not show, and gives an indication of the price band. The timing will depend to some degree on the numbers of people who express an interest in it. Please click here if you would like to be advised when this book/ebook is available (without commitment).